Haas, Chuck (1875- ). Rhymes o' a drifin' cowboy / Chuck Haas. Flagstaff, AZ: Northland Press, 1969. 218 p.
See "The singing cowboy and his gal," p.25-29, includes Gene Autry, Tex Ritter, Roy Rogers and Dale Evans, Cindy Walker, Cousin Emmy (Cynthia May Carver) and Molly O'Day. Hagerty, Donald J. Desert dreams: the art and life of Maynard Dixon / Donald J. Hagerty. Rev. ed. Salt Lake City, UT: Gibbs-Smith, 1998. 296 p.
See Dixon poems: "World's end" p.17 (1896), "Pueblo de los muertos" p.47, "Thoroughfare" p.62, "The mystery" p.73, "Night" p.77, "Grand Canyon" p.83, "Alone" p.90, "Sweat lodge" p.93, "To an old timer" p.101, "Sandhill camp" p.107, "My country" p.110, "Texas dad" p.114, "Visionary" p.128 (1923), "Little God" p.135, "Tabu" p.178, "1934" p.196, "Industrial" p.200, "At last" p.212, "Sanctuary" p.216, "The years" p.216, "Bronco New Year" p.282 (1898). Hale, E.B. "O bury me not." Southern Literary Messenger. 11: 511, August 1845. Haley, J. Evetts. Charles Goodnight: cowman & plainsman / J. Evetts Haley. Norman, OK: University of Oklahoma Press, 1949, c1936. Haley, J. Evetts. "Cowboy songs again." Texas and Southwestern Lore. (Texas Folklore Society) 6: 198-204, 1927. Haley, J. Evetts. The XIT Ranch of Texas / J. Evetts Haley. New edition. Norman, OK: University of Oklahoma Press, 1953, c1933. Content? 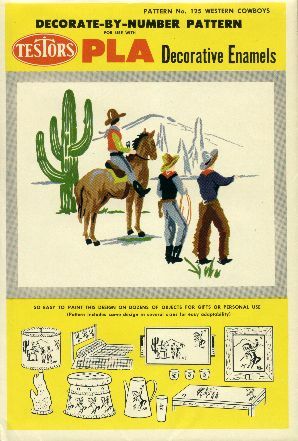 "Testors PLA Decorative Enamels: Decorate-by-number Pattern, Pattern no.125 Western Cowboys." Rockford, IL: Testor Chemical Company, 195-. * Hall, Sharlot M. Cactus and pine: songs of the southwest / Sharlot M. Hall. Boston, MA: Sherman, French & Co., 1911. 204 p.
* Hall, Sharlot M. Cactus and pine: songs of the southwest. / Sharlot M. Hall. 2nd ed., revised and enlarged. Phoenix, AZ: Arizona Republican Print Shop, 1924. 250 p.
* Hall, Sharlot. "The old ranch mother." p.22-24. 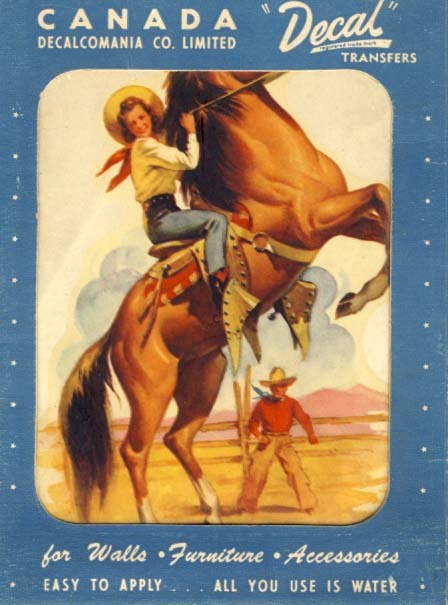 In Cowgirls: 100 years of writing the range. Edited by Thelma Poirier. Red Deer, AB: Roundup Books (Red Deer College Press), 1997. 295 p.
Hall, Sharlot M. "Old range days and new in Arizona." Out West. March 1908, p.181-204. 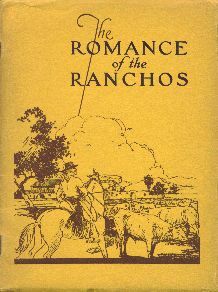 "The Romance of the Ranchos." Los Angeles, CA: Title Insurance and Trust Co., . * Hamalian, Linda. "Regionalism makes good: the San Francisco renaissance." p.214-230. In Reading the West: new essays on the literature of the American West. Edited by Michael Kowalewski. Cambridge [England] ; New York: Cambridge University Press, 1996. * Hamilton, Fern J. Maverick / Fern J. Hamilton. Illustrated by Ted Mullings. 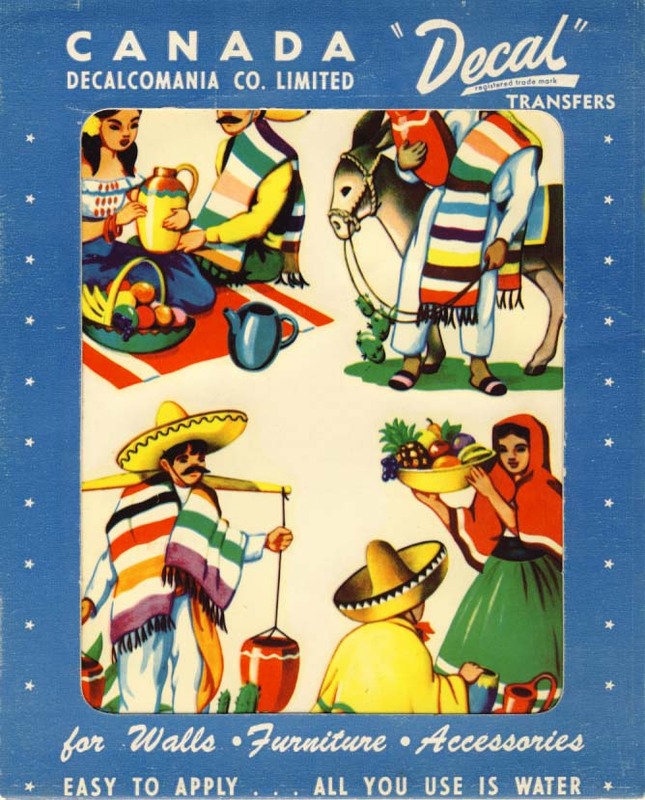 Denver, CO: Big Mountain Press, 1961. 55 p.
Hamm, W. Howard. Trail dust: sketches on the trail / W. Howard Hamm. Tucson, AZ: W. Howard Hamm, 1950. 16 plates with associated poems. * Hammersley, Evadna. A rhapsody of the Rockies / Evadna Hammersley. Denver, CO: World Press, 1944. 118 p.
Hand, Wayland D. "Wo sind die strassen von Laredo"? Die entwicklungsgeschichte einer amerikanischen cowboy ballade. Festschrift für willerich peuckert zum 60. Geburtstag dargebracht von freunden und schülern. Berlin: np, 1955. p.144-161. Handbook of American folklore. Edited by Richard M. Dorson. Bloomington, IN: Indiana University Press, 1983. * Hanson, Joseph Mills. Frontier ballads / Joseph Mills Hanson. With pictures in color and other drawings by Maynard Dixon. Chicago, IL: A. C. McClurg & Co., 1910. 92 p.
Hanson, Joseph Mills. "Last day with the longhorns." Leslie's Monthly Magazine. 58: 681, October 1904. 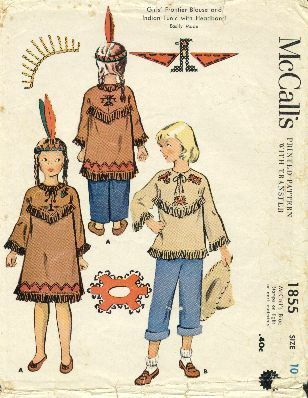 "Girls' Frontier Blouse and Indian Tunic with Headband, McCall's Printed Pattern no.1855." New York: McCall's Corporation, . The happy cowboy sings and plays songs of pioneer days. Edited by Kenneth S. Clark. New York: Paull-Pioneer Music, 1934. Harker, Harry (1880- ). The desert cowboy: word pictures in verse / Harry Harker. Chicago, IL: Adams Press, 1960. 60 p.
He wrote the songs "Beautiful Nevada," "Reno town," "Blue eyed squaw," and others; he also published "Open spaces," "Our Nevada," "Queen of the desert," and others. * Harkness, Samuel. Horse-thief gulch / Samuel Harkness. New York: J. H. Sears & Co., 1928. 106 p.
* Harper, Carol Ely. To a faulty lover. Denver, CO: Alan Swallow, 1946. 39 p. Edition of 350 copies. * Harrington, John Peabody. "Gerald Cassidy." El Palacio (Santa Fe, NM). 37(11/12): 96, September 12- 19, 1934. Harris, Hazel Harper. Wings of the morning / Hazel Harper Harris. Dallas, TX: Cockrell, 1931. Harris, Mark. City of discontent: an interpretative biography of Vachel Lindsay / Mark Harris. Indianapolis, IN; New York: Bobbs-Merrill, 1952. 403 p.
Harrison, Russell M. "Folk songs from Oregon." Western Folklore. 11(3): ?, 1952. Harry Jackson [1924- ], a retrospective exhibition / text by Gene Thornton. Cody, WY: Buffalo Bill Historical Center, c1981. 70 p.
"Decal tranfers for walls, furniture, accessories." * Harte, Bret. The poetical works of Bret Harte / Bret Harte. London; New York: George Routledge and Sons, 1886. 311 p.
See: "San Francisco, from the sea" p.1-5; "Dickens in camp" p. 25-28; "The wonderful spring of San Joaquin" p.186-192. * Harte, Bret. The poems by Bret Harte / Bret Harte. London; New York: George Routledge and Sons, 188-. 311 p. Content similar to previous title. Hartley, Marsden (1877-1943). "Aesthetic sincerity." El Palacio (Santa Fe, NM). 5: 332-333, December 9, 1918. Hartley, Marsden. Adventures in the arts: informal chapters on painters, vaudeville and poets / Marsden Hartley. New York: Hacker Art Books, 1972. 254 p. Reprint of the 1921 edition. Hartley, Marsden. The collected poems of Marsden Hartley, 1904-1943 / Marsden Hartley. Edited by Gail R. Scott; foreword by Robert Creeley. Santa Rosa, CA: Black Sparrow Press, 1987. 360 p.
Hartley visited New Mexico in 1918-1919, painting and writing poetry while visiting Santa Fe and Taos. Included are: "The flatterers" p.58; "To C-," p61-62; "The festival of the corn" p.63-67; "Diabolo" p.81-84; "Un recuerdo - Hermano - Hart Crane R.I.P" p119-122; "Three loving men" p.234. Hartley, Marsden. "The festival of the corn." Poetry. 16: 59-70, May 1920. (Reprinted in The turquoise trail. Edited by Alice Corbin Henderson.) See also Gail Scott. Hartley, Marsden. Twenty-five poems / Marsden Hartley. [Paris, Contact Pub. Co., 1923.] 60 p. Written in Gloucester (MA), New York, Santa Fe and Berlin, 1917-1922. * Haskell, Barbara. Marsden Hartley / Barbara Haskell. New York: Whitney Museum of American Art; New York; London: New York University Press, 1980. 224 p. Catalogue of an exhibition held at the Whitney Museum of American Art, New York, Mar. 4 - May 25, 1980, and The Art Institute of Chicago, Amon Carter Museum of Western Art, University Art Museum of the University of California - Berkeley. Includes "Marsden Hartley: published writings" by Peter Freeman, p.209-211. See: "New Mexico: June 1918 - November 1919" p.57-60. "Hartley was not entirely blameless for his alienation from the community. He had arrived in Taos with a lingering sense of self-importance, and his arrogance and superior attitude may have contributed to his estrangement. Although his work barely supported him, Hartley alone among the Taos artists could boast major shows in Europe and glorious praise from the increasingly respected Gertrude Stein. Local Taos artists were not quick to recognize these laurels, and Hartley's attitude, however valid, undoubtedly made a few enemies." p.58. * Haslam, Gerald W. Workin' man blues: country music in California / Gerald W. Haslam with Alexandra Haslam Russell and Richard Chon. Berkeley, CA; Los Angeles, CA: University of California Press, 1999. 380 p.
See: ch.1 "Country music - roots and stem"; ch.2 "The Crockett family"; ch.3 "1920s"; ch.4 "Gene Autry"; ch. 5 "1930s"; ch.6 "Bob Wills"; ch.7 "1940s"; ch.8 "Spade Cooley." Hastings, George E. "Hell in Texas." Publications of the Texas Folk Lore Society. 9: 178 [175-184? ], 1931. * Hawkes, Clarence. "The pioneer spirit." Ideals (Milwaukee). 10(5): [1-2], October 1953. * Haywood, Charles. Folk songs of the world / Charles Haywood. New York: John Day Co., 1966. 320 p.
See: United States, p.37-45; "Night herding song" p.44-45. Hazard, Lucy Lockwood. The frontier American literature / Lucy Lockwood Hazard. New York: Thomas Crowell, 1927. Note treatment of John G. Neihardt's epic poems. Heckle, Texas B. Rhymes of the frontier / Texas B. Heckle. Vol. 2. 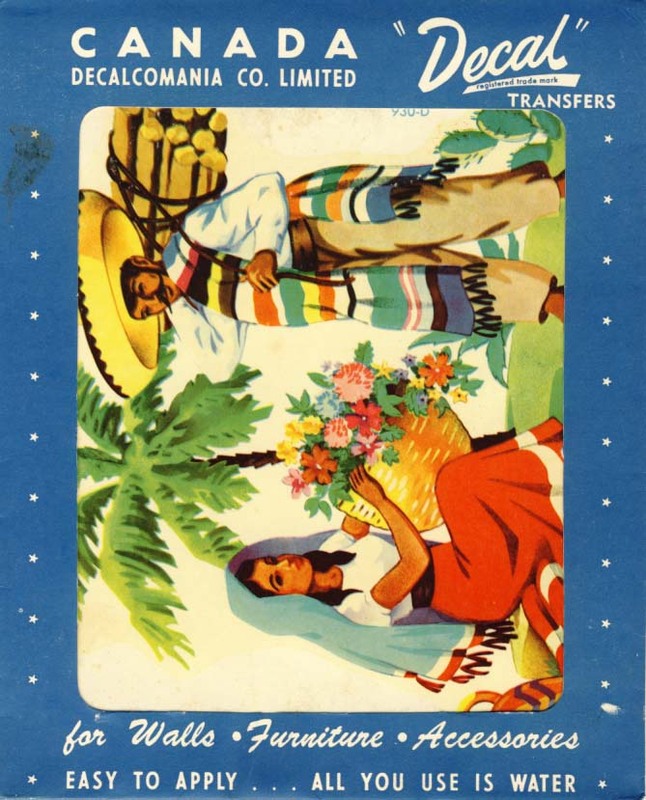 [Arizona]: Arizona Printers, 1929. * Heflin, Jeanette Shelley. A lantern in the heart / Jeanette Shelley Heflin. Dallas, TX: Kaleidograph Press, 1937. 106 p.
* Heggeness, Fred. Goldmine country western record and CD price guide / Fred Heggeness. Iola, WI: Krause Publications, 1996. 448 p.
* Henderson, Alice Corbin (1881-1949). Brothers of light: the Penitentes of the Southwest. New York: Harcourt Brace, 1937. 126 p.
See Hymns (alabados), in Spanish with English translations: "Our father Jesus," "God knocks at this missoin," and "Good-by to this world." p.86-107. Henderson, Alice Corbin. Brothers of the light: the Penitentes of the Southwest / by Alice Corbin Henderson; illustrated by William Penhallow Henderson. Santa Fe, NM: W. Gannon, 1977. 126 p. Reprint of the 1937 edition. "Mary Maxim Graph Style Knitting Pattern: Cowboy, Boys' 4 Ply Cardigan." Henderson, Alice Corbin. "Cowboy songs and ballads." Poetry. 10: 255-259, 1917. Henderson, Alice Corbin. "The folk poetry of these states." Poetry. 14(5): 264-273, August 1920. Henderson, Alice Corbin. "High Chin Bob." Poetry. 10(5): 225- 227, August 1917. Henderson, Alice Corbin. Red earth / Alice Corbin Henderson. Chicago, IL: Seymour, 1920. 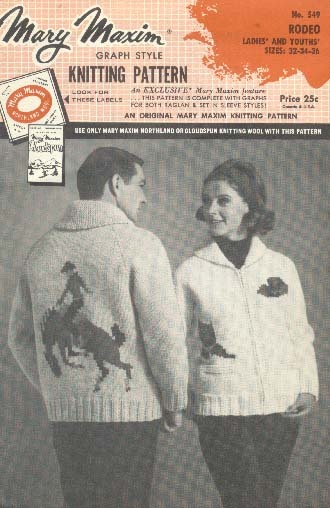 "Mary Maxim Graph Style Knitting Pattern: Rodeo." Henderson, Terry. Have you ever been (too close to a skunk: cowboy poetry describing real Wyoming ranch life / Terry Henderson. Illustrated by Henderson. Douglas, WY: T. Henderson, 1988. 23 p.
Henderson, Terry. I've been there too: cowboy poetry describing real Wyoming ranch life / Terry Henderson. Illustrated by Henderson. 2nd ed. Douglas, WY: T. Henderson, 1987. 19 p.
Hendrickson, Robert. Happy trails: a dictionary of Western expressions / Robert Hendrickson. New York: Facts on File, 1994. Hendrix, William S. "The source of 'Oh, bury me out on the prairie.'" Hispania. 27(1): 29-33, February 1944. Herdon, Jerry A. "'Blood on the saddle': an anonymous folk ballad?" Journal of American Folklore. 88: 300-304, 1975. 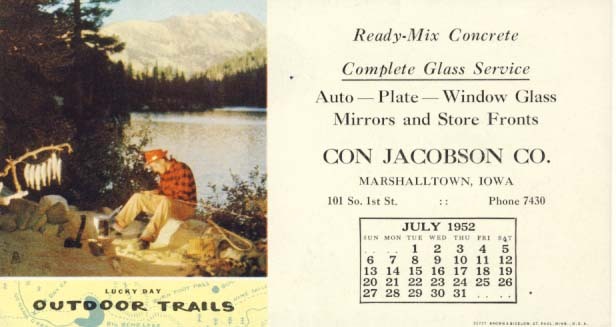 "Con Jacobson Co., Marshalltown, Iowa: Lucky day outdoor trails." Here's to the vinegarroon! 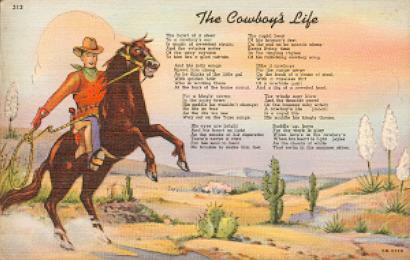 : a collection of cowboy poetry. Edited and with an introduction by Barney Nelson. Alpine, TX: Territorial Printer, 1989. 98 p.
"Preserved in the Sul Ross State University Archives of the Big Bend and Bryan Wildenthal Library, Alpine, Texas." * Hersey, Harold. Singing rawhide: a book of western ballads / Harold Hersey. Illustrated by Jerry Delano. New York: George H. Doran Co., 1926. 189 p.
See: "The lavender cowboy"; also poems on Custer, John W. Hardin, Jesse James, Billy the Kid. p.13. Herzog, George. "The study of folksong in America." Southern Folklore Quarterly, 2: 59-64, 1938. * Hewes, Charles Edwin. Songs of the Rockies / Charles Edwin Hewes. Rocky Mountain National Park, CO: Egerton-Palmer Press; Hewes-Kirkwood, 1922. 295 p. Drawings by Dean Babcock. Inscribed to Willard H. Ashton. 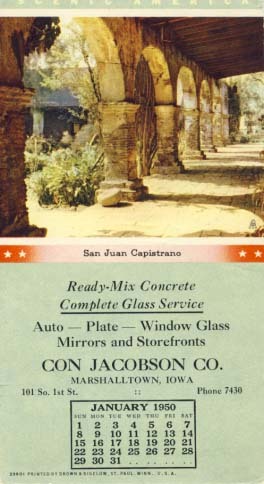 "Con Jacobson Co., Marshalltown, Iowa: San Juan Capistrano." * Hewes, Charles Edwin. Songs of the Rockies / Charles Edwin Hewes. Allens Park, CO.: Egerton-Palmer Press, 1938. 375 p. Drawings by Dean Babcock. Hewett, J.H. "The maid of Monterey." Baltimore, MD: F.D. Benteen, 1851. * H.H. [Helen Jackson] Verses by H.H. Boston: Roberts Brothers, 1887. 191pp. See "The ballad of the gold country" p.49-54; "Two comrades" p.178-181. "High Chin Bob and the mountain lion's ghost." Middle Border Bulletin. 6(1): 3, September 1946. * Higgins, Pecos; Evans, Joe. 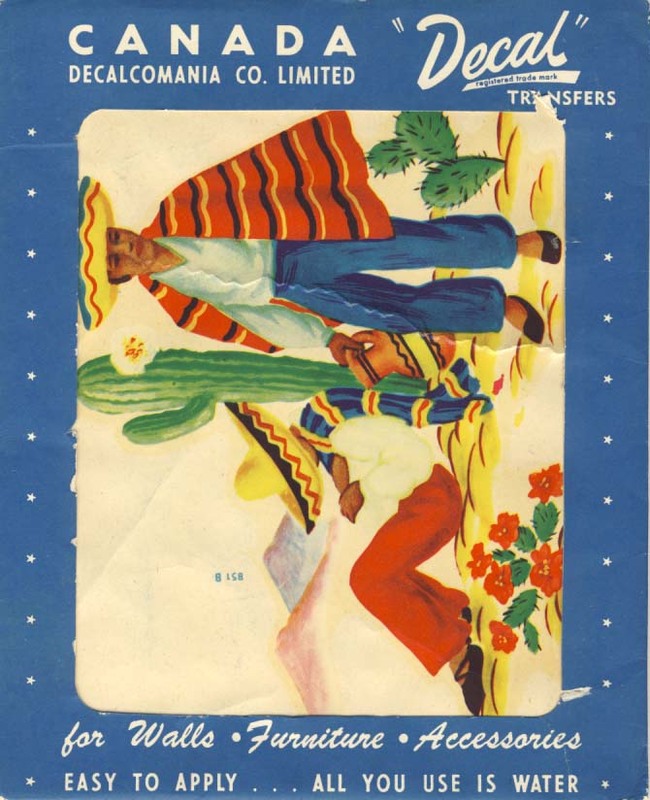 Pecos' poems / P. Higgins and Joe Evans. El Paso, TX: P. Higgins / Joe Evans, 1956. 54 p.
* Highlights: a collection of southwestern verse. [Albuquerque, NM: Chester T. French], 1934. 32 p.
Includes poems by Harvena Conrad Richter, Alice Gill Benton, and other Albuquerque writers, sponsored by the Writer's Class of the Albuquerque Woman's Club. Higley, Dr. "Western home." Kirwin Chief (Kansas). February 26, 1876. On the song "Home on the range." Hill, Clyde Walton. Shining trails / Clyde Walton Hill. Dallas, TX: Shining Trails Sales Co., 1926. * Hill, Ester Clark. "Taos." El Palacio (Santa Fe, NM). 23(11): 294, September 17, 1927. * Hill, Mary. Gold: the California story. Berkeley; Los Angeles, CA: University of California Press, 1999. 306 p.
Little content but three poems in section "Life in the mine": "When I went out to prospect," p.80; "The days of '49," p.83; "A prospector's dream," p.88. Hinkle, James Fielding. Early days of a cowboy on the Pecos / James Fielding Hinkle. Roswell, NM: J.F. Hinkle, 1937. 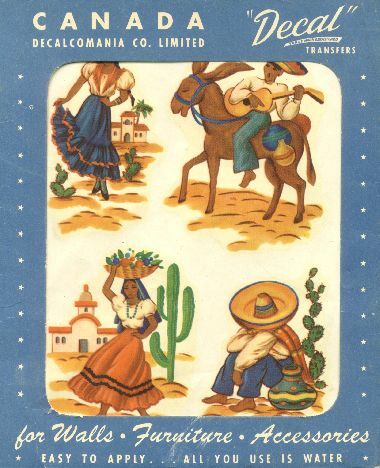 Hispanic folk music of New Mexico and the southwest: a self-portrait of a people. Compiled by John Donald Robb. Norman, OK: University of Oklahoma Press, 1980. 891 p.
Little content of interest. Unaccompanied melodies; songs have Spanish words with English translations. History and encyclopedia of country, western, and gospel music. Edited by Linnell Gentry. 2nd ed. Nashville, TN: Clairmount, 1969. Hobo news, popular cowboy songs of ranch & range. New York: Hobo News, c1939. * Hodgin, Charles E. Rhymes from New Mexico / Charles E. Hodgin. Santa Fe, NM: Hodgin, 1933. 51 p.
* Holding, Vera. Prairie brand / Vera Holding. Boston, MA: Bruce Humphries, 1946. 64 p.
* Holland, Richard. "'It all began the day my conscience died': the cheatin' song from prototype to post-modern'." p.133-153. In 2001: a Texas folklore odyssey / Francis Edward Abernethy, editor ; Shannon R. Thompson, assistant editor. Denton, TX: University of North Texas Press, 2001. 354 p.
Singers mentioned include Tommy Duncan, Jimmy Wakely (1948), Floyd Tillman (1949), Ernest Tubb, Bob and John Wills, Lefty Frizzell, Hank Thompson (1952), and Hank Williams. Holland, Richard A. "Harry Ransom and J. Frank Dobie: the University of Texas brings a renegade back into the fold." Southwestern American Literature. 19(2): 25-33, 1994. Horan, Jack. Burnt leather: poetry sketches from America's outdoor studio / Jack Horan. Boston, MA: Christopher Publishing, 1937. 105 p.
Horan, Jack. Burnt leather: poetry sketches from America's outdoor studio / Jack Horan. Billings, MT: Bit and Spur Publishers, 1937. 109 p.
Horstman, Dorothy. Sing your heart out, country boy / Dorothy Horstman. New York: E.P. Dutton, 1975. * House, Boyce. I give you Texas! 500 jokes of the lone star state / Boyce House. Illustrated by Winston Croslin. San Antonio, TX: Naylor, 1944, c1943. 100 p.
Some poetry, "Hell in Texas" p.12-13. * House, Boyce. Tall talk from Texas / Boyce House. San Antonio, TX: Naylor, 1944. 104 p.
See section "In Rhyme" p.80-85: "My old Stetson hat"; "If a feller's been a-straddle"; "The ol'cow hawss" / E.A. Brininstool; "There's a churchyard down at Ranger" / Will Ferrell; "Old trail driver"; "A cowboy's prayer" / Badger Clark. House, Boyce. Texas rhythm / Boyce House. Dallas,TX: Regional Press, 1936. 104 p.
House, Julius T. John G. Neihardt, man and poet / Julius T. House. Wayne, NE: F.H. Jones, 1920. Houston, Margaret Bell. Lanterns in the dusk / Margaret Bell Houston. New York: Dodd, Mead, 1930. Houston, Margaret Bell. Singing heart and other poems / Margaret Bell Houston. Nashville, TN: Cokesbury Press, 1926, 1927? * Howard, Sarah Elizabeth. Pen pictures of the plains / Sarah Elizabeth Howard. Denver, CO: Reed Pub., 1902. 128 p.
Copy includes prospectus of book with photograph of the author. Includes 21 verses, for each mission, by William Hooper Howells. "the Mission of San Diego, founded 1769," etc. Howes, Wright. Wright Howes, the final edition of U.S.iana: a descriptive bibliography of 11,622 uncommon books and pamphlets relating to the development of that section of the North American continent now known as the United States of America. Edited by William E. Hartley, III. Pine Mountain, GA: WHR Books, 1994. 757 p.
Hubbard, Lester A. Ballads and songs from Utah / Lester A. Hubbard. Salt Lake City, UT: University of Utah Press, 1961. Hubbard, Lester A. "Militant songs of the Mormons." 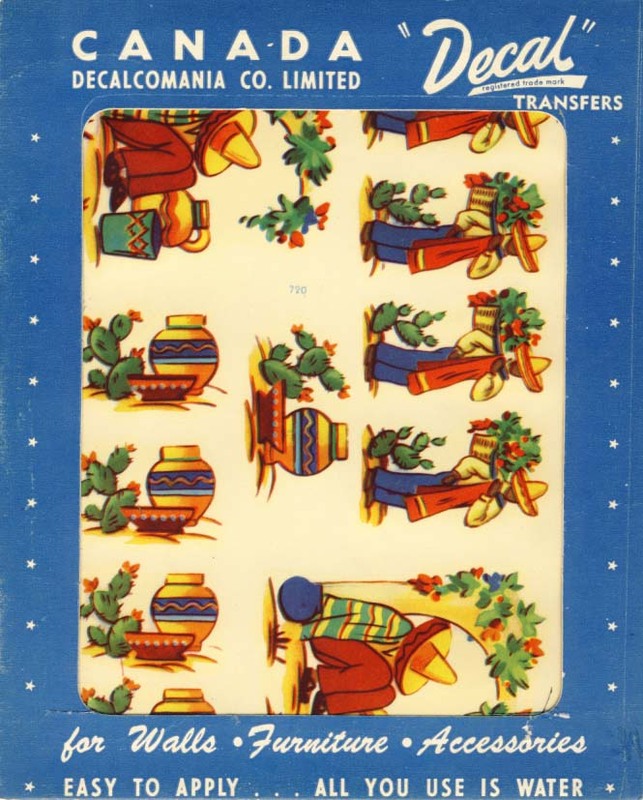 Western Folklore 18(2): 121-130, April 1959. Hubbard, Lester A. "Songs and ballads of the Utah pioneers." Utah Humanities Review. 1(1): 74-96, January 1947. Hughes, Dorothy Belle. Dark certainty / Dorothy Belle Hughes. New Haven, CT: Yale University Press, 1931. Hughes, Marion. Three years in Arkansaw / Marion Hughes. Chicago, IL: ?, 1905. Content? * Hughes, Robert. Rhymes -- for the times -- and other times / Robert Hughes. Toronto, ON: Hughes, [?1943]. 75 p.
* Hulbert, Archer Butler. Forty-niners: the chronicle of the California trail / Archer Butler Hulbert. Boston, MA: Little, Brown and Co., 1931. 340 p.
Many poems interspersed within the text: see "Crossing the plains," p.50-51. Hull, Myra E. "Cowboy ballads." Kansas Historical Quarterly. 8(1): 35-60, February 1939. * Hunt, Robert. The early world and other poems / Robert Hunt. Santa Fe, NM: Villagra Bookshop, 1936. 28 p.
Hunter, John Marvin. The trail drivers of Texas / John Marvin Hunter. 2 vols. San Antonio, TX: Jackson Printing, 1920, 1923. Hurd, Harry Elmore. West of Eden / Harry Elmore Hurd. Boston, MA: H. Hurd, 1934. Huston, John. Frankie and Johnny / John Huston. New York: Boni, 1930. * Hutchins, Charles Bowman (1889-1955? ); Hutchins, Helen Owen. Whiff ‘o the West: new notes and rustic rhymes of the Great West, its birds, trees, flowers, and natural charms / by Charles Bowman Hutchins; Helen Owen Hutchins, co-author. 2nd ed. Boulder, CO: Boulder Publishing Co., 1927. 87 p. Cover design by Frederick L. Hutchins. First edition 1925. * Hutchins, Charles Bowman; Hutchins, Helen Owen. Whiff o' the West: new notes and rustic rimes of the Great West, its birds, trees, flowers, and natural charms / by Charles Bowman Hutchins; Helen Owen Hutchins, co-author. 5th ed. Boulder, CO: The Taylor Co., 1937, c1925. 36 p.
Hutchinson, W. H. (William Henry) (1910-1990). A bar cross man: the life and personal writings of Eugene Manlove Rhodes / by W.H. Hutchinson. Norman, OK: University of Oklahoma Press, 1956. 432 p.
See: Rhodes' "The hired man on horseback." In The turquoise trail, 1928, p.106-112.